Microsoft SharePoint Server 2010 includes a full range of business intelligence features and functionality. These include Excel Services, PerformancePoint Services, and Visio Services. SharePoint Server can also support integration with SQL Server Reporting Services and PowerPivot for SharePoint. All of these applications enable you to choose which tools to use to create reports, scorecards, and dashboards. To help your organization be more productive, consider storing and managing your business intelligence content in a central location, such as a Business Intelligence Center site. This article contains information about how to create a central location and manage user permissions and access to the content. Contains links to information about different approaches to monitoring performance, such as using SharePoint Status Lists and PerformancePoint scorecards. Contains links to information about Excel Services and about the interactive visualization tools in PerformancePoint Services. Excel Services enables you to build worksheets, PivotTable reports, PivotChart reports, and then publish those reports to SharePoint Server. PerformancePoint Dashboard Designer enables you to create scorecards and reports, such as analytic charts and grids, strategy maps, KPI Details reports, and references to existing reports, such as Excel Services reports, SQL Server Reporting Services reports, ProClarity Analytics Server reports, and Web Page reports. Contains links to information about how to create dashboards by using tools in SharePoint Server, or by using tools in PerformancePoint Services. The links in this panel include Start using PerformancePoint Services, which opens a home page for PerformancePoint Services. On that page, you can click Run Dashboard Designer, or you can click links to articles that provide additional information about PerformancePoint Services. The Business Intelligence Center site enables dashboard content authors to easily access the tools that they have to create business intelligence content. For example, the Business Intelligence Center site contains links to information about Excel Services and PerformancePoint Services. The site also contains links to sample data in Excel that users can easily access. A Dashboards library that contains only published dashboards that were deployed from Dashboard Designer. A Data Connections content library that contains data sources that can be used for various reports and scorecards. This library also contains server connection information and security details for each data source. A PerformancePoint Content list that contains scorecards, reports, filters, unpublished dashboards, and other dashboard items that were created by using Dashboard Designer. Dashboard items can be organized into folders within this list to make them easier to find and manage. A Documents library that contains sample Excel Services workbooks and can serve as a location to store other business intelligence files. These include Reporting Services reports, Visio Services reports, and so on. The Documents library is created automatically when a Business Intelligence Center site is created. However, it must be added to the page to be visible. Information about how to do that is included in the following section. When you create and configure a Business Intelligence Center site, you create a new site collection and select the Business Intelligence Center site template. You can create a Business Intelligence Center site before you have enabled and configured certain services, such as PerformancePoint Services or Excel Services. However, certain capabilities are unavailable until those services are configured. For example, if PerformancePoint Services is not configured, you and other users will be unable to run PerformancePoint Dashboard Designer to create PerformancePoint reports, scorecards, and dashboards. Similarly, if Excel Services is not configured, you will be unable to display all or part of an Excel workbook in a browser window. Log on to the computer that is running the SharePoint Central Administration Web site. Make sure to use an account that is a member of the Farm Administrators SharePoint group. For more information about security and permissions, see Security planning for sites and content (SharePoint Server 2010). If a User Account Control dialog box appears, click Yes to continue. In the Central Administration site, in the Application Management section, click Create site collections. On the Create Site Collection page, in the Web Application section, confirm or select the Web Application for which you want to create a Business Intelligence Center. In the Title and Description section, in the Title box, type a name for the Business Intelligence Center. For example, you can type BI Center in the Title box. In the Web Site Address section, type a word or phrase in the URL box. For example, you can type BICenter in the box to specify a Web site address that resembles http://[webapplicationname]/sites/bicenter. In the Primary Site Collection Administrator section, specify an administrator for the site collection. On the Top-Level Site Successfully Created page, click the link for the Business Intelligence Center site that you just created to open it. Keep the Business Intelligence Center open. Now that you have created a Business Intelligence Center site, the next step is to assign user permissions to control who can view and use business intelligence content. To view, edit, or create content in the Business Intelligence Center, users must have certain permissions assigned in SharePoint Server. In addition, users must have certain permissions assigned in the servers that store data that is used for dashboard content. For more information, see Authorization and permissions in PerformancePoint Services (SharePoint Server 2010). We recommend as a best practice that you use SharePoint groups such as those that are described in the following table to help organize your roles. Users assigned to this group can view but not create or edit content in the Business Intelligence Center. This includes PerformancePoint content. Users assigned to this group can view, edit, and create content in the Business Intelligence Center. This includes PerformancePoint content. Users assigned to this group can view, edit, create, and publish dashboard content in the Business Intelligence Center. This includes PerformancePoint content and dashboards. Users assigned to this group can view, edit, create, and publish content in the Business Intelligence Center. This includes PerformancePoint content and dashboards. In addition, these users can view, edit, and assign user permissions for content in the Business Intelligence Center. Begin by creating the Active Directory groups that you want for managing user permissions. Log on to the domain controller computer as the domain administrator. Click Start, click All Programs, click Administrative Tools, and then click Active Directory Users and Computers. In the Active Directory Users and Computers dialog box, right-click Users, click New, and then click Group. In the Group name box, type the name of the group that you are creating from the previous table. Repeat for each group that is listed in the table that was mentioned earlier. First, assign Read permissions to the BICenterRead group. Navigate to the Business Intelligence Center. The Web site address (URL) resembles http://[webapplicationname]/sites/bicenter. In the Users/Groups box, type BICenterRead. Next, assign Contribute permissions to the BICenterContribute group. In the Users/Groups box, type BICenterContribute. The next step is to assign Design permissions to the BICenterDesign group. In the Users/Groups box, type BICenterDesign. Finally, assign Full Control permissions to the BICenterFullControl group. In the Users/Groups box, type BICenterFullControl. Now that you have created a Business Intelligence Center site and assigned user permissions, the next step is to configure it by adding a Documents library to the Quick Launch. The Documents library was automatically created when you created the Business Intelligence Center site. It contains sample Excel workbooks and serves as a central location for documents. These include Excel Services files. 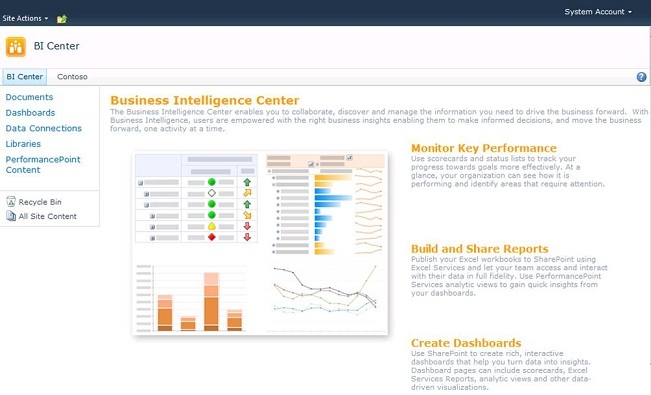 In the Business Intelligence Center site, click Site Actions, and then click View All Site Content. In the Document Libraries list, right-click Documents, and then click Copy shortcut. Return to the Business Intelligence Center site, click Site Actions, and then click Site Settings. In the Look and Feel section, click Navigation. In the Navigation Editing and Sorting section, select Documents. Click Move Up or Move Down until Documents is positioned where you want it. Click OK to close navigation settings. Verify that Documents appears in the Quick Launch. At this point, the Business Intelligence Center is created and configured. The Report Center site is a SharePoint site that is available in Microsoft Office SharePoint Server 2007. The Report Center site is a central location where you can manage certain kinds of business intelligence content. This includes reports and dashboard pages that you create by using SharePoint Server. In SharePoint Server 2010, the Report Center site is replaced by the Business Intelligence Center site. That is, the Report Center site is not available in SharePoint Server 2010. If your organization is upgrading from Office SharePoint Server 2007 to SharePoint Server 2010, you cannot upgrade an existing Report Center site to a Business Intelligence Center. Instead, you can create a new Business Intelligence Center site, and then move your content from the Report Center site to that Business Intelligence Center site. The Business Intelligence Center site that is available in SharePoint Server 2010 enables you to centrally store and manage even more dashboard content than the former Report Center site. You can store and manage content that is created by using multiple applications, such as PerformancePoint Services, Excel Services, and Visio Services. If SQL Server Reporting Services is integrated in your environment, you can publish Reporting Services reports to the same Business Intelligence Center site where your other business intelligence content resides. And, if PowerPivot for SharePoint is configured in your environment, you can publish PowerPivot workbooks to that same Business Intelligence Center site. Create a site or a document library that uses a name other than Reports.